Click image for a 778x2063 pixel version of this image in a new window. [heroicrelics: Based on the aerodynamic probe and paint pattern, this appears to be an Atlas A launch]. Scan by archive.org; cleanup by heroicrelics. The vernier engine thrust control system [heroicrelics: the LR-101 engine] for the Atlas and Thor missiles has reached an operational production status. Production and testing of this unique auxiliary missile control system is currently underway at Rocketdyne Neosho. Rocketdyne reports that the low thrust engine system is achieving an extremely high degree of reliability in test firings. The near ultimate in simplicity of fabrication and assembly gives it a mass production capability. Click image for a 2103x787 pixel version of this image in a new window. VERNIER ENGINE is subjected to long duration hot fire check. Television and movie cameras film the operation. Additional component test cell areas are in the background. The system was designed and developed specifically for directional and thrust stability of the Atlas missile system. Later the engines were designed into the Thor IRBM. Both Atlas and Thor are equipped with two of the small auxiliary power units. 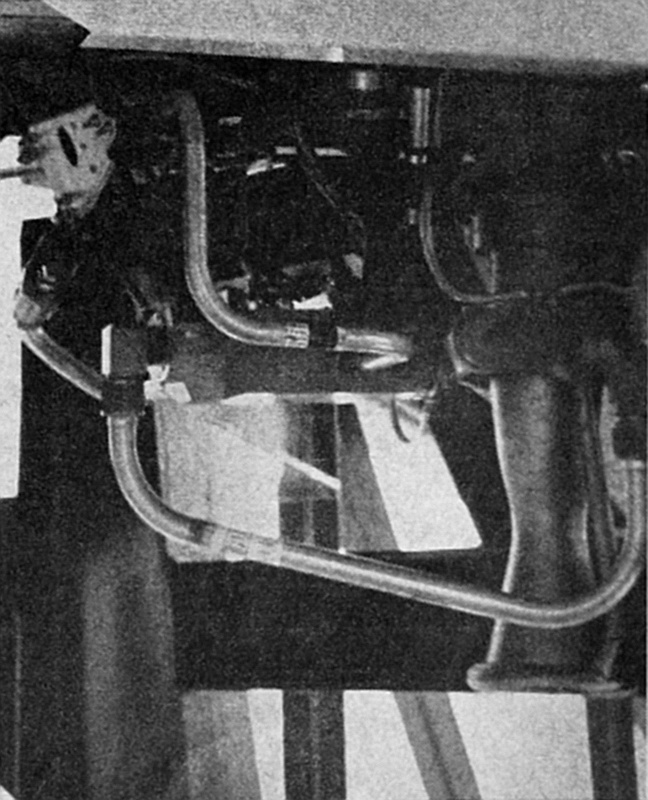 The verniers provide adjustment for any thrust variations in the parallel booster engines of the Atlas, in addition to maintaining roll control and directional stability. On the Thor, with its single sustainer engine, two of the verniers mounted at the base of the rocket 180 degrees apart provide roll control and precise adjustment in pitch control. Click image for a 771x952 pixel version of this image in a new window. VERNIER ENGINE mounted on Thor IRBM. Another unit is mounted underneath on opposite side of the sustainer. The vernier engine roll control for the Atlas and Thor reaches a high degree of sophistication when compared with the Jupiter system. The exhaust of the gas generator of the Jupiter, located at the base of the missile, can be swiveled through an 180 degree arc for supplying thrust about the vertical axis. Gimbaling freedom of the vernier engines provides approximately 120 degrees in the roll axis and 60 degrees in the pitch axis. The vernier engines are ignited shortly before missile takeoff. Initial thrust is reduced approximately 20% for the first few seconds of flight, when the verniers are required to provide only roll control. Thrust is provided for several seconds after sustainer engine cutoff to insure attainment of programmed missile attitude in azimuth and elevation. The verniers operate on the missile's propellants of liquid oxygen and RP-1, a higher grade of kerosene fuel than that used in turbo-jet engines. An efficient regenerative cooling system is employed to drop the 5,000 degrees Fahrenheit combustion temperature to a safe level for sustained burning. Engines are cool to the touch after several minutes firing duration. Rocketdyne Neosho, in addition to production testing, is engaged in a continuing development program. Hot firing tests include long duration fixed firings in order to check reliability, and thrust variation tests combined with continuous gimbaling operations. Click image for a 1387x868 pixel version of this image in a new window. 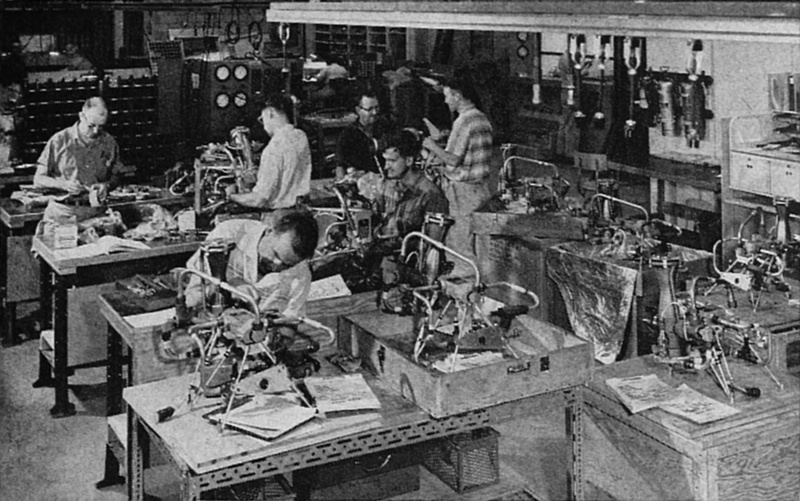 WORKMEN AT ROCKETDYNE Neosho's production plant assemble complete vernier engine systems. 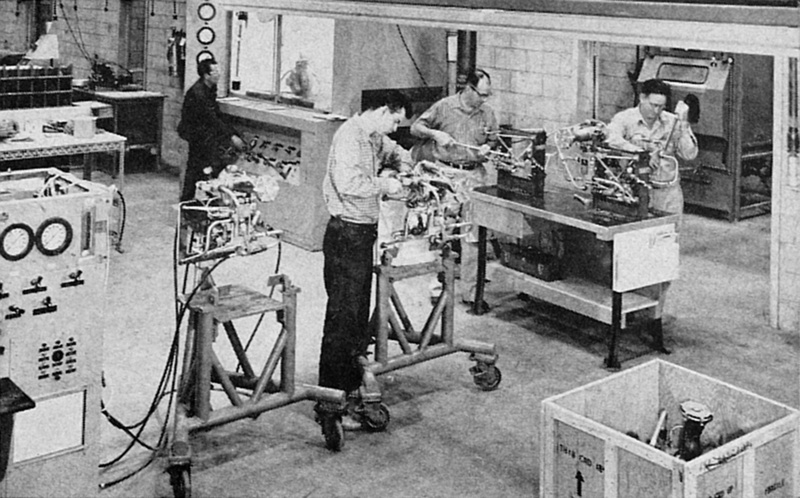 Engines are given a routine production check before packaging. Sample hot firings of this production power package are made regularly. Click image for a 1393x868 pixel version of this image in a new window. THE ENGINES are attached to moveable jigs in bench clamps before packaging for shipment to the prime systems contractor, where the engines will be installed on the missiles. Fabrication of the units requires a minimum of plant operating area. Click image for a 1387x959 pixel version of this image in a new window. 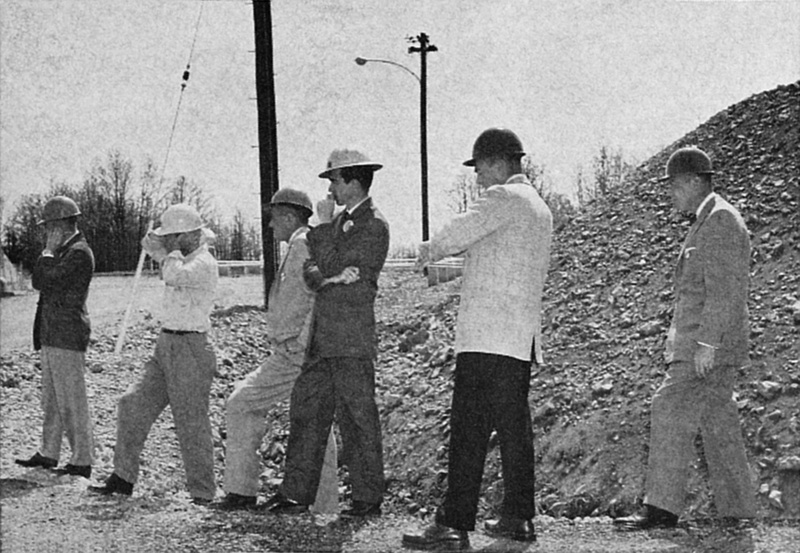 WATCHING THE STATIC FIRING of a vernier engine: Gene Andrews, test engineer; T. S. Dowe, industrial engineer; E. E. Thiessen, test foreman; Norman L. Baker, m/r editor; E. A. Wright, factory manager; and Bill Van Dyke, public relations. The contents of this page, in their entirety, were reproduced from the July 21, 1958 issue of Missiles and Rockets , available on archive.org. Since these magazines are freely available on archive.org, I assume that the copyright has been transferred to the public domain.